... The gaseous PVT properties of 1,1,1,2,3,3,3-heptafluoropropane (HFC-227ea) were measured at temperatures from 318.15 K to 348.15 K using the Burnett- Isochoric coupled method, and at 330.15 K and 380.15 K using the Burnett expansion method., respectively. The maximum uncertainties of the measurements were estimated to be within 1.5 kPa for pressure and within 5 mK for temperature. A Virial equation for HFC-227ea was developed. The purity of the HFC-227ea sample used in the present measurements was 99.9 mol %. Contributors: Smirnova, N. N., Letyanina, I. A., Zakharova, Y. A.[Yu. A. ], Pimerzin, A. A., Vishnevskaya, E. E.
... In the present research, the temperature dependence of heat capacity C_p,m = f(T) of neopentylbenzene C6H5-C5H11 has been measured between T = (6 and 350) K in the precision adiabatic vacuum calorimeter and reported for the first time. The temperature and enthalpy of fusion of neopentylbenzene and the total mole fraction of impurities have been determined. The experimental results have been used to calculate the standard (p = 0.1 MPa) thermodynamic functions of neopentylbenzene over the range from T approaching (0 to 350) K. The standard entropy of formation of the compound under study at T = 298.15 K has been calculated. Contributors: Reddy, K. S., Swamy, A. V. N., Prasad, T. E. V.[T. E. Vittal], Prasad, D. H. L.
... Bubble point measurements (at 95.6 kPa) over the entire composition range are carried out for the binary mixtures formed by 1-hexanol with the: nitro-compounds (acetonitrile, acrylonitrile N,N-dimethyl formamide and aniline) and substituted benzenes (o-xylene, chlorobenzene, and nitrobenzene), employing a Swietoslawski type ebulliometer. Wilson model is found to represent the measured liquid phase composition versus bubble point temperature data well. Computed values of the vapor phase mole fractions and liquid phase activity coefficients are tabulated and briefly discussed. ... This study deals with the solubility limits of organic liquids liable to be spilled at sea during shipwrecking or other incidents at sea. The effects under consideration are induced by both salinity and temperature. The former is described through use of the Setchenov relationship, and the latter by using the Van't Hoff equation. 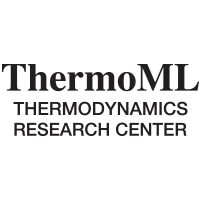 A coupling of both relationships led to an equation applicable to scarcely soluble liquids and expressed in a simplified form usable in decision-support systems as a result of the choice of the reference state when writing the thermodynamic relationships. The mathematical relation we found was tested on experimental data about four compounds, i.e. dimethyldisulfide (DMDS), methyl methacrylate (MMA), 1-butanol (1-But), and methyl ethyl ketone (MEK), chosen because of their wide use in the industry and frequent transport by sea. All of them were studied at four salinity values and five temperatures, and the mathematical relation under test proved to be quite satisfactory. ... Vapor pressures of six pentanols, 2-methyl-1-butanol (CAS Registry Number 137-32-6), 2-methyl-2-butanol (CAS Registry Number 75-85-4), 3-methyl-1-butanol (CAS Registry Number 123-51-3), 3-methyl-2-butanol (CAS Registry Number 598-75-4), 2-pentanol (CAS Registry Number 6032-29-7) and 3-pentanol (CAS Registry Number 584-02-1), were measured by the precision ebulliometry over an approximate pressure range from 9 to 99 kPa. The absolute uncertainties in pressure and temperature are estimated to be less than or equal to 7 Pa and 0.02 K, respectively. The results are represented by the Antoine equation and compared with available literature data. ... In order to select the most suitable ionic liquids (ILs) for certain applications it is necessary to know some of their thermophysical properties, such as density or viscosity. In this work we have performed density measurements of two ILs 1-ethyl-3-methylimidazolium ethylsulfate and 1-(2-methoxyethyl)-1-methylpyrrolidinium bis(trifluoromethylsulfonyl)imide in a broad range of temperature and pressure ((278.15 to 398.15) K and up to 120 MPa). From these measurements we have obtained other volumetric properties such as isothermal compressibility and isobaric thermal expansivity. In addition, density values were predicted using the method proposed by Gardas and Coutinho and also that proposed by Jacquemin et al., obtaining a good agreement with experimental values. Contributors: Santos, J. C. d., Mazzer, H. R., Machado, G. D., Andreaus, J., Cabral, V. F., Zabaloy, M. S., Cardozo-Filho, L.
... The dyeing of textile fibres of poly-ethylene terephthalate (PET) in a supercritical medium is an environmentally friendly technological alternative to the conventional water-based dyeing process. In this work, the solubility of the monoazo disperse dye 4-((2,6-dichloro-4-nitrophenyl) azo)-N-(cyanoethyl)-N-(acetoxyethyl) aniline (CAS number 5621-31-4, also known as C.I. Disperse Orange 30 ) in supercritical carbon dioxide (SC-CO2) was experimentally studied within a dye mole fraction range from 6.55 x 10-6 to 9.31 x 10-6 and over the temperature range from (303.15 to 333.15) K. The resulting measured solid-fluid transition pressures fell in the range from (9.93 to 14.82) MPa. The measurements were performed using the static-synthetic method. The dye solubility in carbon dioxide was found to increase with increasing pressure. The experimental results were correlated with a model that combines the Peng-Robinson equation of state for describing the fluid phase and a standard equation for the fugacity of the pure dye in solid state. The reference state for such equation is the sublimation curve of the pure dye. ... Phase equilibria between (alpha-naphthol + vanillin) and (beta-naphthol + vanillin) systems have been studied by thaw-melt method and the results show the formation of simple eutectic mixtures. Crystallization velocities of components and eutectic mixtures were determined at different stages under cooling. With the help of differential scanning calorimeter (DSC), the enthalpy of fusion of components and eutectic mixtures was determined and from the values excess thermodynamic functions viz., excess Gibbs free energy, excess entropy, excess enthalpy of hypo-, hyper- and eutectic mixtures were calculated. Flexural strength measurements were made in order to understand the non-ideal nature of eutectics. FT-IR spectral studies indicate the formation of hydrogen bond in the eutectic mixture. Anisotropic and isotropic microstructural studies of components, hypo-, hyper- and eutectic mixtures were made. Jackson's roughness parameter was calculated and found to be greater than 2 suggesting the faceted morphology with irregular structures. The overall results have shown that there is a weak molecular interaction between the components in the eutectic mixtures and the (alpha-naphthol + vanillin) eutectic is more stable as compared to the (beta-naphthol + vanillin) eutectic system. ... The standard (p = 0.1 MPa) molar enthalpies of formation, in the condensed phase, of the three monoiodoanisoles, were derived from the respective enthalpies of combustion, measured by rotating-bomb combustion calorimetry. Their enthalpies of sublimation/vaporization, at T = 298.15 K, were obtained by Calvet microcalorimetry using the high-temperature vacuum sublimation technique. Moreover the standard molar enthalpy, entropy and Gibbs energy of sublimation, at T = 298.15 K, of 4-iodoanisole were derived from the Knudsen mass-loss effusion technique. Combining the former sets of experimental results, the standard molar enthalpies of formation in the gas-phase, at T = 298.15 K, of 2-, 3- and 4-iodoanisole were derived, respectively, as: (15.1 +- 2.1) kJ mol-1; (11.8 +- 2.2) kJ mol-1, and (12.4 +- 1.6) kJ mol-1. The experimental values of the gas-phase enthalpies of formation of each iodoanisole were also estimated by means of the empirical scheme developed by Cox and by density functional theory calculations employing the B3LYP/6-311++G(d,p) approach. Estimated values are in excellent agreement with the reported experimental ones derived in the present paper. ... The enthalpies of solution of diglyme, triglyme, tetraglyme, pentaglyme and hexaglyme in N,N-dimethylforamide-methanol mixtures (DMF+MeOH) have been measured at 298.15 K. On the basis of the obtained data, the effect of the acid-base properties of the DMF+MeOH mixtures on the standard solution enthalpy of glymes in this mixtures has been analyzed. The obtained results have been compared with analogous data obtained in N,N-dimethylformamide-water (DMF+W) mixtures.